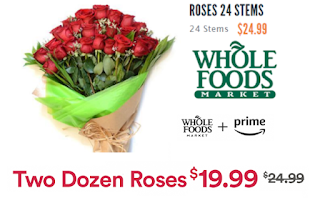 2 Dozen Long Stem Roses $19.99 For Amazon Prime Members + Free Valentine's Pickup (or Any Other Day) At Whole Foods. They have all colors, Red, White, Pink, Orange or Yellow. These are actually great quality roses and usually last a long time after buying them. Great deal for Valentine's day flowers!